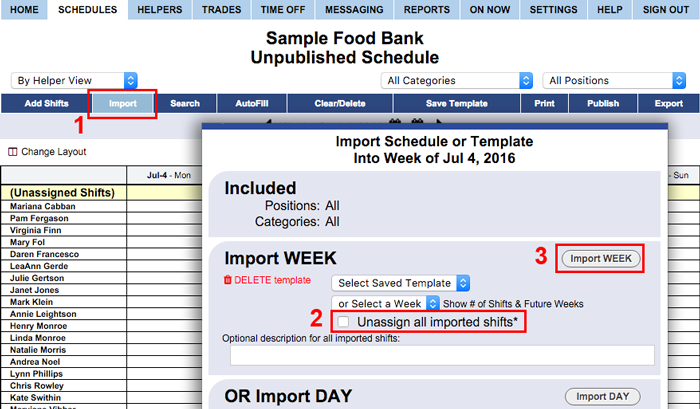 Once you have entered your first schedule, it is easy to create new schedules using the Import function to copy those shifts to another week. Import any previous week "as is" by choosing a date, or Import a saved template by choosing a template name. When Importing, you can check off to Unassign all the old help assignments (or do this later with the Clear button) and then AutoFill to get the best possible help assignments for the new week. When your schedule is ready you can Publish and you are done! Note that by filtering your schedule view to a certain position, category, or group before clicking Import, you can Import only those particular shift position(s) from the previous week or template. After Import, you will see an Import Results Summary showing how many shifts were imported, how many are unassigned, and information about why some shifts were automatically unassigned if they conflicted with time off, etc. You also can Import shifts for one DAY at a time by using the "Import DAY" in the bottom section of the Import window.